Indiana Thoroughbred Owners and Breeders Association (ITOBA) held their annual awards banquet at Indiana Grand Racing & Casino Sunday, April 14. The event, which was held in conjunction with the Indiana Thoroughbred Breed Development, honored the champions of 2018 just before the 2019 racing season gets underway Tuesday, April 16. Hosted by Rachel McLaughlin, Indiana Grand's on-air racing analyst, the program began with divisional champions. Bucchero took home top honors for the second straight year as 2018 Champion Horse of the Year. 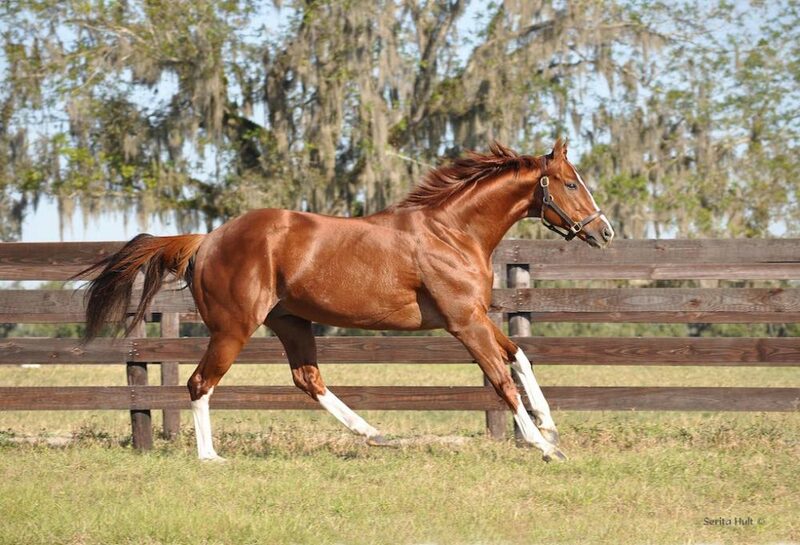 Bucchero retired last fall as the state's all-time leading money earner with $947,936 in career earnings. The Graded Stakes winner was also named 2018 Champion Indiana Bred Older Horse of the Year. Bucchero is owned by Ironhorse Racing Stable LLC and trained by Tim Glyshaw. Southern Chase Farm and Karen Dodd is the breeder of the flashy chestnut, who now stands at stud at Pleasant Acres Stallions in Ocala, Fla.
Other winners on the evening included Fortin Hill (Indiana Bred 2YO Colt/Gelding); Discreet Beauty (Indiana Bred 2YO Filly); Ace of Aces (Indiana Sired 2YO Colt/Gelding); Fireball Baby (Indiana Sired 2YO Filly); The Money Dance (Indiana Bred 3YO Colt/Gelding); Flurry (Indiana Bred 3YO Filly); Its Just Fate (Indiana Sired 3YO Colt/Gelding); Entrusted (Indiana Sired 3YO Filly); Marina's Legacy (Indiana Bred Older Mare of the Year); Operation Stevie (Indiana Sired Older Horse of the Year); Expect Indy (Indiana Sired Older Mare of the Year); Whistlin' Jean (Indiana Broodmare of the Year); and Noble's Promise (Indiana Stallion of the Year). In addition to the awards program, ITOBA also recognized State Representative Bob Cherry for their Hall of Distinction award. Herb Likens, ITOBA president, made the presentation to Cherry and thanked him for his years of dedication and service to the horse racing industry in the state of Indiana. The Indiana Thoroughbred Breed Development Program also handed out year-end awards, led by its Horse of the Year The Money Dance. The ITBDP's awards are based solely on money earned in 2018. The Money Dance (Jimmy Creed – Whistlin Jean, by Pure Prize) made more than $279,450 in 2018 while racing under the green silks of co-owners Penny Lauer and Falcon Racing Stable. While racing at Indiana Grand, The Money Dance won the Governor's Stakes and hit the board in the To Much Coffee Stakes, both black-type stakes races for breeders Michael and Penny Lauer. The 4-year-old colt was euthanized after fracturing his sesamoids during an allowance race at Oaklawn Park in March of this year. He earned $283,025 in his career with a race record of 17 starts, three firsts, two seconds and three third places. When asked about the pairing of Whistlin' Jean to Jimmy Creed, who stands at Spendthrift Farm in Lexington, Lauer pointed to how Jimmy Creed reminded him a lot of his sire, Distorted Humor. Whistlin' Jean was bred to Jimmy Creed earlier this year for a full sibling, in hopes of bringing another to the winner's circle. For the fourth year in a row, Michael and Penny Lauer took home the award for Breed Development Breeder of the Year, which is based on total Indiana Breeder's Award payments. The couple, staunch supporters of the Indiana program, bred 32 Indiana-bred horses that raced during 2018. Their earnings totaled $1,172,240, plus they received $229,006 in Breeder's Awards, eclipsing the amount earned in 2017. The Michael E. Lauer Racing Stable saw many Indiana-bred Thoroughbreds go to the winner's circle at Indiana Grand Racing & Casino, including The Money Dance, winner of the $150,000 Governor's Stakes; Flurry winner of the $150,000 First Lady Stakes; and Obsolete, winner of the $100,000 Ellen's Lucky Star Stakes. The Lauer farm is located in Finchville, Ky., with horses racing in Indiana, Oaklawn Park, Turfway Park, Churchill Downs, Arlington Park and more. The farm is family-owned and operated, with Michael as the head trainer, Penny managing the bookkeeping, horse juggling and daily operations, and their three daughters, Elizabeth Lauer Sharrett, Sara Lauer Turley and Abby Lauer helping at in the office and on the farm. As trainer, with earnings of $2,067,894, 2018 was Michael's best year since he hung his shingle in 1976. The pair also bred the ITOBA Indiana-bred 3-year-old colt/gelding of the year The Money Dance and the ITOBA Indiana-bred 3-year-old filly of the year Flurry. Entrusted, bred by the Lauers, earned her owners, Christine and Vince Cagle, the 2018 ITOBA Indiana-sired 3-year-old Filly award. The Lauers also took home the silver mint julep cup from The Blood-Horse as Indiana breeder of the year. It was a bittersweet evening for Richard Rigney and his family, as their beloved stallion Noble's Promise earned the ITOBA sire of the year and earned Rigney the breed development program's stallion owner of the year for 2018. The stallion by Cuvee and out the Clever Trick mare, The Devil's Trick, passed away in early 2018. The Grade 1 winner had earned more than $1,193,000 in his career before going to stand at Breakway Farm in Dillsboro, Ind. Rigney earned $65,140 in stallion owner awards in 2018 from the breed development program. Racing at Indiana Grand begins Tuesday, April 16 and extends through Wednesday, Nov. 6. Racing is held Tuesday, Wednesday and Friday at 2:15 p.m. with post time set for Saturday at 6:15 p.m. The 120-day racing season includes two Thursday racing cards July 18 and Sept. 5 at 2:15 p.m.
For more information, go to the website at www.indianagrand.com. This entry was posted in Bloodstock, NL List and tagged bucchero, horse of the year, Indiana, indiana breeding, Indiana Grand, indiana thoroughbred breed development, indiana thoroughbred owners and breeders association, ironhorse racing stable, itoba, rachel mclaughlin, Tim Glyshaw by Press Release. Bookmark the permalink.